In my employment at The Career Development Center, I have come across many people who need to find something else to take up that last inch or two at the bottom of their page. Assuming you’ve used all of your professional experiences already, there’s a few options there, but let’s focus on my favorite— the activity section! Now some people have reservations about using the activity section, “but it’s unprofessional,” “but it’s irrelevant.” Nah. Not really. When a recruiter looks at your resume they can see a lot more than just a list of jobs, and what school you went to. They start to see your personality, how you chose to format things, the font you chose, and what order you put the sections in. Sure, maybe they don’t look into all of this on the first round going through resumes, but if they make it down to the final ten resumes, you can bet that yours will be examined beyond scrutiny. This is where your activities section comes in. So, if you have space for an activities section, it can make the difference between being the new hire and staying on the job search. If you ever have questions about what you should include in your resume, please visit The Career Development Center at Oregon State University. Posted in Career Corner, Resumes. Cover letters are something that not very many people hear about until they are well into their college career, but over the past few years the tendency for an employer to ask for a cover letter has become more and more popular. I was curious to find out why that is and why cover letters are so important to employers in the hiring process so I decided to sit down with someone who has had to interview and hire people in the past, my mother. The purpose of this interview was to ask her not only why cover letters were important but also to get her own personal view on why, if they are so important, don’t people hear about them until they are well into college as well as maybe any advice she had on how to write a cover letter. I began by asking her when she first heard of a cover letter and as it so happens she never heard about them until she had lost her job and started going back to school, which is crazy and she said she feels like if she had heard about them sooner she might have felt more prepared in applying to school and getting a new job. Then we started talking about why a cover letter is important to the employer when they are looking to fill a position. She told me the biggest reason that they are important is because “they give you a sense of the persons’ character and personality (if done right) that you can’t get from a resume and that might just be what gets them that interview.” This reminded me of something I learned while working at Career Services at Oregon State University, which is that a resume is the facts of what experienced you have gained and when and where you completed said experience, but a cover letter is the passion; The passion of not only why you did said experiences but also (and more importantly) why you are looking to start this new experience that you are applying for. As an employer my mother said that there is nothing better than reading about why someone wants to work for you and why they are so excited to be a part of your organization, because I mean who wants to hire someone who isn’t excited to be there right? So advice from an employer’s view on how to write a cover letter is very simple in my mother’s eyes, “Cover letters take time and thought. You can’t just throw something together because you don’t know what to do and hope that it works. If you don’t know how to do something ask, plain and simple and it is no different with cover letters. There is tons of good information out there that can help you with all the formatting and content of what should be in each paragraph. But it is not enough to simply look up an example and then just wing it on writing one. You also have to research the company or organization to which you are applying and ask yourself why you want to work for them. If you can’t convince yourself that you are excited, you will never convince an employer. But the most important thing is to make sure that you are tailoring in to the company and even to the person who is going to be interviewing you. This way they know that you did your homework and it shows that you are the kind of person who doesn’t take the easy way out. So if you are applying for something that requires a cover letter take your time, do the research, put some thought into it, and ASK FOR HELP. A second pair of eyes is always helpful too.” The only thing that I have to add to this is that a great place to ask for help is somewhere like the Career Services Center at Oregon State University, where people are trained on how to help you write and effective cover letter. The last question I asked was “When do you think students should learn about and start practicing writing cover letters?” Her answer: “If it were up to me students would start with cover letters and resumes in the 8th grade, because this way when they go to look for a job while they are in high school they have already been exposed to the concept of a resume and cover letter can at least write one that will make the employer take notice. Instead of being so lost and maybe not getting a job or interview simply because they were never taught a basic skill that isn’t going to go away at any point in their life.” This is just something to think about. Why is it that some people can graduate high school never even hearing of a cover letter much less learning how to write one? If you or someone you know has anything to do with primary education this might be something that we can look into, it may not be something as drastic as making a full class or anything but maybe just a workshop that students can take even just in high school that will give them the chance to at least get some kind of exposure to this necessary skill. Posted in Cover Letters, Resumes. Ready to get inspired for your job, internship, or career search? Career Services will spotlight an OSU student that has inspired us when it comes to their career development. Check out their success stories—besides inspiration, they also show that academic major does not have to restrict your goals and that there are many ways to define success. Want to nominate an OSU student or alum for the Student/Alum Spotlight series? Or do you want to share your own success? Then please fill out this quick form and Career Services will contact the person nominated. While a student at OSU, what have you done so far to gain experience? I joined the OSU women’s lacrosse team when I was a freshman and volunteered to be an officer my sophomore year. Since then I was elected president and have been so for the last year. This has taught me how to be a team player and leader. I recently just finished my evaluation and assessment internship at KidSpirit. My job was to input progress report data into an Excel database. I am continuing to work for KidSpirit during my senior year in the field of finance and special projects. Being a math major, I want to get a job in mathematics as soon as I graduate. I am interested in becoming an actuarialist so I will continue studies in that specific field. 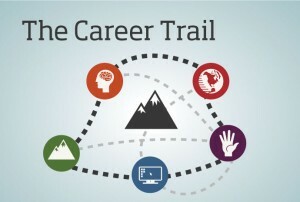 What advice do you have for others who are preparing for their job or internship search? Start early! Write your first rough draft of your resume as soon as possible but not later than your sophomore year and continue to work on it through your time at college. Meet with career services just to talk through what you want to do doing your time in college and what you are interested in as a career. Did Career Services and/or anybody else assist you with your career development and preparing you for an internship or job? If so, how? Yes, very much so. Just simply sitting there and listening to them explain where you want to go in life and giving you options on how to get there was a great help. It is also important for someone to continue to ask you why you want to proceed with one goal because your mind might change throughout each year in college on where you want to be after graduation. 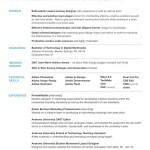 Also, they have resume writing help, mock interviews, job fair information, and general data on prospective employers. Posted in Job Search Strategies, Resumes, Uncategorized. High School: When is it time to say goodbye? When I applied for my first job out of high school, my entire resume was made up of activities and clubs that I had engaged in during high school to make myself look impressive to the world. I was proud of the long list of things I had done: math team, speech and debate, and the like. I was convinced that I had picked up a plethora of skills that I could take with me for the rest of my life. But then I got most of my way through the first year of college here, and was told suddenly and harshly that it was time to take high school off of my resume. That was it— the long list of accomplishments that I had spent four years developing was erased in the time it took to hit the backspace key. 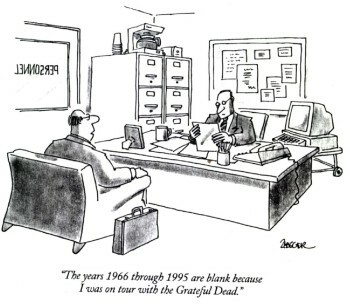 Then I looked at my resume, and surprisingly it wasn’t empty. It was a good time to take high school off, to make room for more opportunities. So when is the optimal time to break free of your past? My first recommendation is to start moving away from high school as soon as you can once you get to college; college is a great place to start forming new and exciting relationships with professors, and to get involved in clubs and activities, sometimes even the same activities you did in high school. These sorts of things will make great references and talking points on your resume that would draw any employer’s eye. And really— let’s face the facts— you’re in college now. Everybody knows that you went to high school, and did at least reasonably well, so it is definitely time to take your diploma or GED out from your education section of your resume. There are other sections of your resume though. One big aspect of a resume will always be to choose relevant experiences to include. Sometimes the most relevant experiences will be from high school, and it is okay to use those for your first few years of college, but by the time you are an upperclassmen, it’s time to lose the training wheels. While you are in your first two years of college, though, you can pull from those things you did in high school- volunteer opportunities, and even select clubs and activities, they can all be relevant to a job you are applying for. There is one last aspect of your high school experience, and that is one that will never have to be omitted from your resume— the skills you developed. By the end of high school there are some skills we might have developed: proficiency with Microsoft Office, intermediate skill in a foreign language, technical writing, public speaking, etc. These are all skills you can always boast on your resume all the way through college. Remember when you are constructing a resume that you only want to put down the most relevant experiences, and sometimes those will come from high school, but college is a place to start developing new and exciting sets of skills to show off to employers. What are the skills you attribute to your high school experience? How are you building on those in your current academics and career opportunities? With summer coming to an end and the academic year fast approaching you may find yourself trying to squeeze in a few last minute trips and moments of relaxation. Take the next few weeks to also think about some goals you have for this coming academic year, whether they are academic, professional or personal. Here are a few tips for starting the academic year off right! Write out a list of all your commitments for this coming academic year including classes, clubs, organizations, work responsibilities. Write out goals for yourself, both short term and long term, and make a list of the steps you can take to accomplish those goals. Set a timeline of when you want to have them completed. Once you have completed one goal, set another. Meet your Academic Advisor or visit a Career Counselor. Make a point to meet with your Academic Advisor early in the term to plan out the academic year, talk about career goals and make sure you are on track with meeting your degree requirements. If you find yourself struggling to choose a major, consider meeting with a Career Counselor; they can help you outline your strengths and interests as well as prompt you with questions to start thinking about your future. Depending on your level of commitments, consider getting involved with a new club or organization on campus, completing an internship or getting a part-time job. All of these opportunities will build your resume and enhance your skill set. 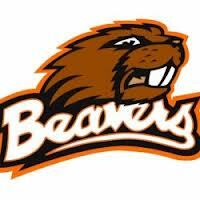 You can check out internship and job opportunities on Beaver JobNet. Posted in Career Exploration, Career Services, Internships and Experience, Job Search Strategies, Majors, Resumes. The first thing to do when you’re hunting for jobs is to make sure you would actually be a fit for that position. Do you meet all of the minimum qualifications? And have you made it clear that you do? Make sure that you’re being explicit about having the skills and qualifications that they’re asking for, because making the information hard to decipher is only doing you a disservice. Another part of making it clear that you’re a good fit for a position is tailoring your resume. Read the job description carefully and write your resume using important words and phrases from it. For example, if a job description lists teamwork as an important skill to have in a candidate, write an accomplishment statement detailing working on a team to achieve a specific outcome. Hiring managers often will only look at each resume for a few seconds, so don’t be afraid of being extra-obvious. There’s a fine line to walk between making your resume unique and having it become unprofessional. Definitely avoid pictures and art, unless you’re in a field like graphic design and you know for a fact that an artistic resume is expected. 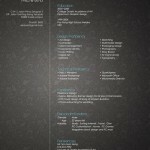 Even then, look up examples of resumes for your field and see what kind of design is expected. Also avoid funky fonts and colors, as they can make your resume harder to read and annoy a hiring manager. If you’re wondering how to spice up your resume, definitely focus on the formatting. 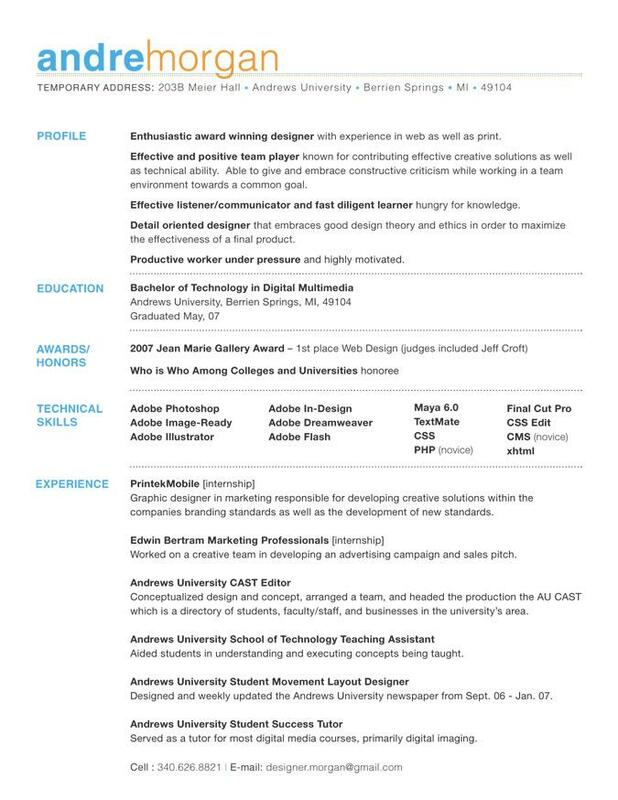 Feel free to use bold and italics, different font sizes (within reason), and play with the actual layout of your resume. You may be tempted to use a resume template, but it is strongly recommended that you don’t because you won’t have as much freedom with how it looks and they often turn out bland. A huge turn-off to hiring managers is a lack of attention to detail. Spelling and grammar errors are especially bad, and many recruiters will toss your resume at the first error they encounter. Don’t rely on spell check to catch everything (it definitely doesn’t), instead actually read through your whole resume and have other people read through it as well. It’s always good to have multiple sets of eyes on your resume to catch mistakes that you might have unwittingly missed. Another sign that you didn’t spend enough time on your resume is if you’ve used a lot of clichés and vague statements. So many people say things like “hard worker”, “team player”, or “innovative thinker” – but don’t offer any proof. Use your accomplishment statements to prove that you have these qualities. Instead of just saying “team player”, detail a time when you worked with a team of people to achieve something. Be as quantitative as possible, because hiring managers are much more likely to be impressed with numbers and concrete facts about what you’ve accomplished. Quantitative accomplishment statements do take some time and may seem overwhelming, but they’ll be well worth it in terms of making you stand out from the crowd. Be patient with the process of building your resume. Good resumes take time to make, but the time spent will benefit you in the end when you get called in for an interview. “Not everybody can be famous but everybody can be great, because greatness is determined by service.” ~Martin Luther King, Jr.
As a Career Advisor, I often work with students who are dismayed by the resume writing process. They don’t have experience directly relevant to their field of interest, and it seems like they need experience to get that experience. Before I learned about career development and targeting resumes to specific opportunities, I thought this way too. How do I get a job if I need a job to get a job? But there are tons of ways to gain experience in your field or to develop transferable skills that you would use in almost any field. It’s all a matter of how to frame your experience to show potential employers that you have the skills you need to do the work. You can do internships, seasonal temporary jobs, on-campus jobs, and join student organizations. You can do undergraduate research or start your own small company. The avenue I’d like to advocate for today, in light of the upcoming holiday celebrating the incredible inspiration of Martin Luther King, Jr., is to volunteer. Martin Luther King, Jr. once said, “Life’s most persistent and urgent question is, ‘What are you doing for others?’” With this statement, he was calling on all of us to step forward and serve. If you get involved in community service, you will help others. You will forge lasting and rewarding relationships. And others will teach you incredible lessons about their lives and what needs to change in this world to make it better. Think about the skills you already have that you could offer. Are you great at designing websites? Organizing people? Planning events? Fundraising? Working with children? Do you have particular expertise that a nonprofit or human services organization would find useful? Offer that expertise up to an organization and commit some of your time to their work. Or, on the other hand, do you want to learn more about a specific area within human services or what environmental nonprofits do? Offer your volunteer hours to an organization in that field and commit to doing whatever the organization needs. I would be willing to bet that you will probably get more out of the experience than you ever thought possible. It will surprise you how much you will learn, about yourself and what you are capable of accomplishing, as well as the field you volunteer in. And you will be helping others and the world in the process. The added bonus is that you can easily record this information on your resume, highlighting any transferrable skills or knowledge that relates to the positions you apply for. These volunteer experiences show employers a lot about you. They show a lot about your character and the values you hold. They show a ton about your work ethic and ability to multitask, juggling school and volunteering responsibilities. They also can show, dependent on the organization you work with and the work you do, relevant skills for your field of interest. In addition, you will build a network of people who can be a support to you in your job search and may offer referrals or connect you to colleagues. Finally, your volunteer experiences will teach you amazing things about how to work and communicate effectively with others who may be different from you, which is a skill you need in any workplace. You can write about those people skills on your resume. I hope you will take a moment this coming 3 day weekend to reflect on the ways in which you serve and could serve others, in honor of an amazing man who called on us all to do so. And I hope once you reflect on that, you decide to volunteer. A couple of events are coming up around campus that can help you make this happen. First, participate in the MLK Day of Service, sponsored by the Center for Civic Engagement. In addition, February 6th, Career Services and the Center for Civic Engagement are teaming up to sponsor the Nonprofit and Volunteering Fair. Also, Career Services has a page dedicated to finding volunteer opportunities, as does the Center for Civic Engagement. You can make a difference in the lives of others by offering your time and your skills, and you will learn and grow and develop in the process. Try it! Posted in Career Exploration, Career Services, Internships and Experience, Networking, Resumes. Question: I am a student-athlete and it takes up a lot of my time while in college. How do I include this experience on my resume? 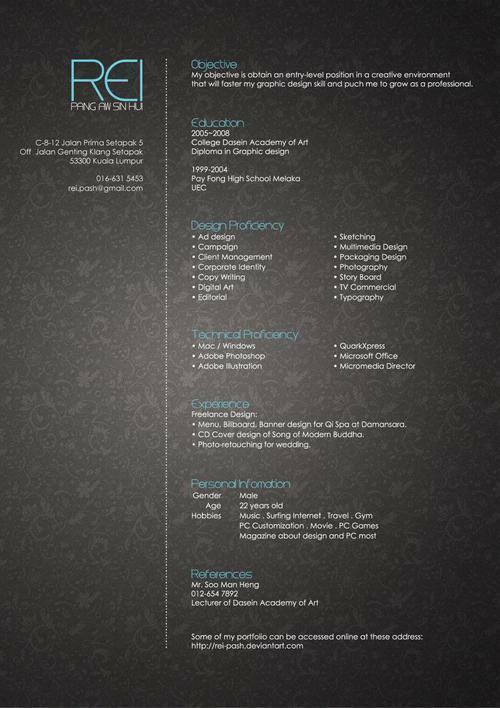 Here is the full resume of the example above. So just like any other experience you would include on your resume, be sure to give the details and make yourself stand out. And always tailor your resume for each job! Any other questions when it comes to resume writing? 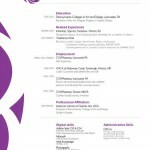 What other experiences do you find difficult to include on a resume? Posted in Q&A Monday, Resumes. 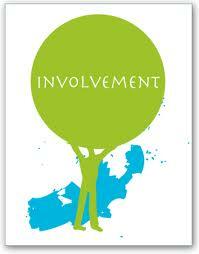 Question: Can I use involvement activities as experience on my resume? YES! What you list under “Experience” doesn’t necessarily have to be paid. It can include clubs and organizations you have been involved in, internships, volunteer work, research, in-depth projects from school, etc. Employers like to see that you got involved while attending college. If you can, try to get involved in activities that relate somewhat to your major but we also encourage you to try new things because you never know where that may lead. The SSI (Student Sustainability Initiative) is now accepting applications for two openings on the SSI Fee Board. These are volunteer positions and Fee Board members are collectively responsible for the advancement, effectiveness, health, and longevity of the SSI. Applications should include a current resume and a cover letter addressing why you are interested in the position and what you envision as a culture of sustainability at OSU. Applications are due by Monday, August 6th at 11:59 PM and should be submitted to ssi.feeboard@oregonstate.edu. A full position description of an SSI Fee Board member can be found on the SSI website. So go get involved but be careful of getting overly involved where you stress yourself out and can’t focus on school. After all, the main reason you are at OSU is to get a degree. What ways have you gotten involved in college or how do you plan to get involved in the future? As someone who has seen hundreds of resumes during my time at the Career Services Center, I can definitely say that the typical resume is a snore to look at. I’ve seen enough of the ol’ Times New Roman standby to last a lifetime. This trend is understandable. Certain fields like accounting and business actually prefer the traditional over the aesthetically pleasing. And with only a few templates and examples to choose from, how creative can anyone really get with these things? Lucky for you I have taken it upon myself to clear the air. There are several things you can do to help your resume stand out from your competition. I’ll start with the most basic of techniques: the line. 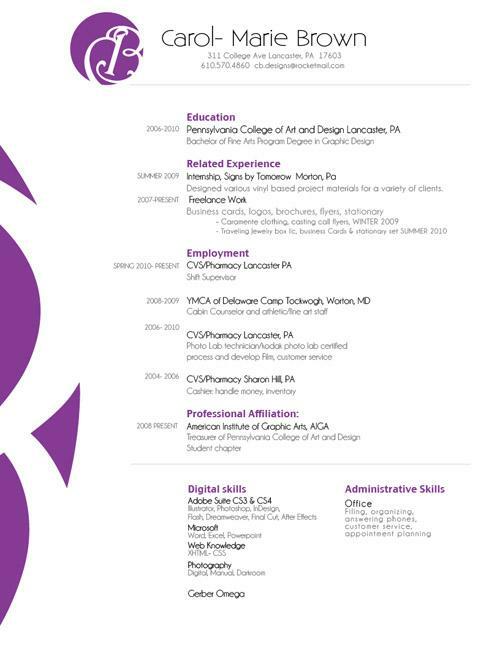 Adding a few divisionary lines between the sections of your resume makes it visually easier to approach. Subconsciously, readers will think the resume will actually take less time to look over –since you’ve already divided the information into concise sections. At the very least –put one under your heading. It will automatically make your name and contact information stand out tenfold. While this example does utilize color –something that would not be appropriate for those more conservative jobs- it also displays the line division I was talking about. Everything looks clear and concise. I would have recommended to Andre that he use bullet points to further organize his information –but hey, there is always room for improvement. Another thing I wish more people would do –is create a personal logo. No one does this anymore (probably out of lack of know-how) –but it really is much less complicated than it seems. The key is simplicity. You want it to compliment your resume, not overpower it. As you can see in this example, Carol simply played with a font she liked and the first letter of her last name. Simple and effective. Yes, the purple was probably a step too far –I think black ink would have been a better choice (since it is always a safer bet to err on the conservative side with colors). However I think her design is fantastic, aka not a snooze fest. She could also easily use the logo on business cards as well. If you haven’t already, check out VistaPrint.com to take advantage of their free business card offer. Nothing looks better than a snazzy business card attached to a polished resume. Another easy change to make is the paper you are printing these bad-boys on. Anyone can use the standard printer paper –not everyone takes the time to use the higher quality (aka better looking) resume paper. One reason for this is that this stuff is pricey. I’ve seen it as high as $15 for 50 sheets (yikes!). But don’t despair –several colleges on campus are secretly giving away these gems to students who ask for it. Also keep in mind that one box of resume paper can last you as long as a couple years. Looking at it as a long-term investment can help take the sting out of spending so much on paper. Obviously this is not your run-of-the-mill resume paper. 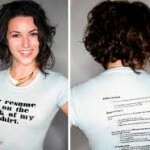 This would definitely not be appropriate for those conservative office jobs I’ve been mentioning –but if you’re entering a more creative field, this could be a fun way to help your resume catch your interviewer’s eye.